Search Engine Optimization (SEO) techniques are very helpful for the reach, growth and sustainability of your business. You need to take your business to the right customers at the right time. SEO searches are a great way to reach your customers, and prospects. But, is there a way to reach customers instantly, so that you reach them before your competition does? Well, there is, and that we what we mean by Local SEO search. What is Local SEO search? Local SEO is a one of the most effective form of online marketing, when local businesses can reach to local customers to promote their services, exactly at the same time, when they are looking or searching for a particular product or service. These search engines use Google and other business directories like TouchLocal, Superpages, Yelp, and others. What is the importance of Local SEO search? The Local SEO search can be beneficial in many ways. Local customers are looking for local businesses: Studies have shown that 68% of people use online searches and directories to find local businesses. So, it is a great return on investment. High conversion rates: Local SEO searches lead to about 50% conversion rate that is 1 in 2 people might turn out to be your actual customer. Mobile searches: With more and more people shifting to mobile marketing, local SEO can be a great way to reach customers in real-time through local apps and searches. Local marketing is timely and targeted: This reduces the reach time for local businesses, and helps to reach prospects faster. Moreover, many of the best local SEO opportunities are free as of now. Credibility: Studies show that 70% of people trust online customers reviews for a product or service they are looking for. So, optimized local searches can really be helpful for the customer to choose the right service and also to create your brand value. Optimizing Google My Business page: Work on your My Business page, so that it is optimized in the proper way. Add proper content, high quality images, contact information, business category and all other relevant information. This is one of the best platforms by Google to connect you directly to the customer, and boost your local ranking strategy. 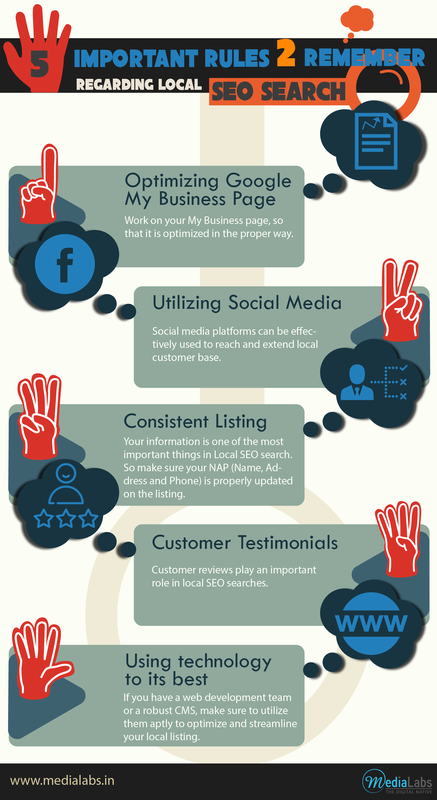 Utilizing social media: Social media platforms can be effectively used to reach and extend local customer base. Your presence in social media also contributes to your local visibility and business. For example, Snapchat has a geofiltering feature, which can attract customers to a local event. Consistent listing: Your information is one of the most important things in Local SEO search. So make sure your NAP (Name, Address and Phone) is properly updated on the listing. An accurate and consistent listing also increases your credibility and chances of showing at the top. Studies have shown that 85% of small businesses feel that local marketing is important, but only half of them update their listings properly. Customer testimonials: Customer reviews play an important role in local SEO searches. They can affect your brand value and help to increase your customer base. So, urge your online customers to leave a feedback, rating, and review about your services, which gives you an edge over your competitors. Research has shown that customer reviews are around 12 times more reliable than manufacturer descriptions, and people tend to trust such testimonials more. Using technology to its best: If you have a web development team or a robust CMS, make sure to utilize them aptly to optimize and streamline your local listing. Geotagging, or the process of tagging geographical locations to posts, videos or images, can be really helpful for optimizing content, increasing local visibility and attracting traffic to your website. Also, make sure that all the technical aspects and elements of your website are proper, including page load time, error handling and navigation. Local SEO searches are highly effective, when you know the needs and requirements of your local customer, and you have the products and services to cater to them. These are mostly geographical location based searches, so they are really helpful for local business. So, if you have a local business to grow, get your local SEO search strategies in place, and get ready to reap benefits. Visit our website www.medialabs.in to know more about us. Follow and like us on Facebook,Twitter,LinkedIn and Google+ to get regular updates from us. When you have a website, blog or marketing portal, you need to review it from time to time to check its performance. Based on it, you can decide how to improve and improvise your blog. The growth and success of your portal, depends a lot on its reach and marketability. And, these can be enhanced by increasing the number of visitors, likes, shares, sales, etc. To improve these, you need to have an insight of how your portal is performing in terms of number of users, conversions, page views, behavioural pattern of the visitors, etc. A good analytical software can help you with these data and statistics, which will help you to improve and manage your online presence in a better way. Google Analytics is free analytic tool by Google, which monitors, tracks and report about your website traffic, and other parameters. This is the most widely used web analytics services, and have proved to be beneficial for its users. According to rough statistics, around 48 million websites use Google analytics for their analysis process, and the figure will continue to rise. Using Google analytics is very easy and simple. Once you are well versed with the terminologies and process, it will be really easy to handle the app. Let us take you know a few important basics of Google Analytics. First, we will take a look at the common terminologies used in the software and their meanings. It is a descriptive attribute of an object, which can be given different values like Browse, Exit Page, etc. They are individual elements of a dimension that can be measured as a sun or a ratio like Page Views, session etc. It is a period of time that a user is actively engaged on your page or app within a data range. People (both new and returning) who have had at least one session within a selected data range. Total number of pages viewed, including repeated views of a single page. This is the average number of pages viewed during a session. This is the average length of a session. This is the percentage of single-page visits, for example, when a person leaves your site from the entrance page without interacting more. This is an estimate of the percentage of first time visits. This measures how often a visitor takes a specific action on your website. This is the number of times goals have been completed. This allows you to add parameters to any URL of your website to collect more information about your referral traffic. This is how you acquire users. This parameter helps you to improve your website content. You can download and install the software. Then, you need to set up your account. You can use your existing Google account for this. 100 Google Analytics accounts are allowed under one Google account. Up to 50 website properties can come under one Google Analytics account and up to 25 views under one website property. If you have more than one portal to track, then you can have two accounts- one for business and another for personal. You can also configure various business portals under a single business account. After entering account details and choosing options to configure, where your results will be stored, you will be given a unique Google Tracking ID, which you have to install in all your websites. Then, you need to setup your Goals under Admin. This is very important as it will tell you when something important happens on your website. Then, you need to turn on the site search so that you know what visitors are trying to search on your webpage. You need to enter the query parameter for your webpage(s). This is very important when your website has a search field. Then, all the other important parameters, importation and necessary information need to be entered and your Google Analytics account is almost set. Dashboard creates a customized view of your Google Analytics data. This is a good way to see certain subsets of data without going through the entire standard reports. These are links to your favourite Google Analytics reports. This is an alert of when a specific event occurs. When you set this up, you will get an email for dramatic changes in sessions, goal conversions, etc. This is the data to see what is happening right now on your webpage like current visitors, active pages or locations. These are detailed reports about your audience. It will tell you about audience Demographics, Interests, Locations, Language, Behavior, etc. 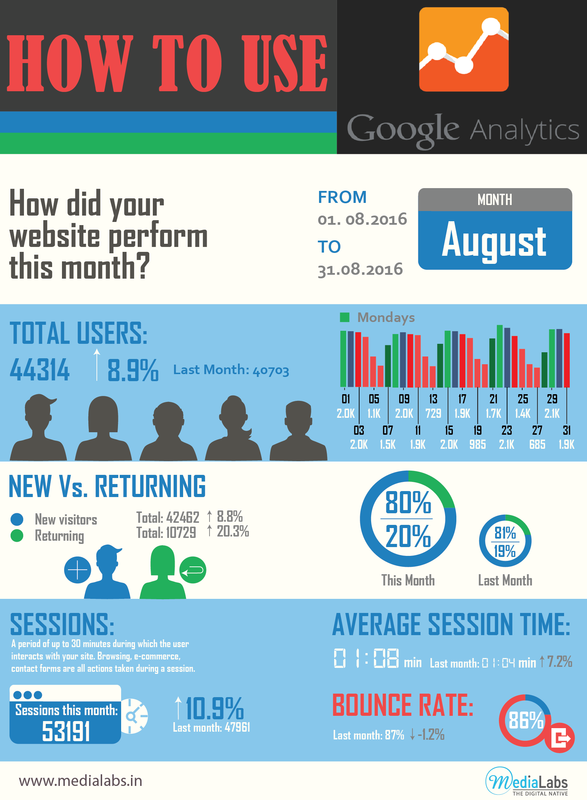 These reports will tell you what drove visitors to your website. Generally, it gives data in main categories (Channels) and specific sources (Source/Medium). It will also give you an insight about your social media engagement. This will give you data about the content of your page like most searched thing, top entry and exit pages of your website and others. This talks about your goals and the conversion rate of your website. It will show you the number of conversions, which path visitors took for conversion and much more. Google Analytics is an extensive software, which encompasses a lot of different features. What we have discussed above is just a guide for the beginners. However, there is still a lot to explore, understand and implement in the app. If you want to go deeper, you need to first understand the parameters and measurables, so that you can decide the kind of detailed report you want from the app. Using Goggle Analytics, gives you a 360 degree view of your website and helps you improve it from every aspect.